Innovative access control. That's what the new wAppLoxx System delivers. It combines the advantages of a traditional access control system with flexible and smart online control via the web or an Intranet. Create and adjust locking plans, react instantly to events, open doors at the touch of a button and arm your alarm system: you can now do it all from the comfort of your home/office or from anywhere on the go. An app even makes it possible to adjust settings simply by using your smartphone. The wAppLoxx system is extremely secure thanks to the Secure Socket Layer (SSL) encryption protocol. Data can also be conveniently stored on site on an intranet if required. The communication between app and wAppLoxx is achieved via a P2P connection that has a secure server for direct communication between components, which makes unauthorised access by third parties impossible. wAppLoxx doesn’t just provide increased break-in protection: doors can also be opened by app to trusted persons, even if nobody is at home. An alarm system is already installed? This can also be armed and disarmed quite simply using the wAppLoxx. Similarly, electronic door openers, lights and other electronic devices can be controlled by the app. When combined with the ABUS video surveillance, you can even see who is at your front door and respond accordingly: either open the door or keep it locked. You always have an overview in the log view. All incidents and events related to access are saved here and if desired, can also be sent to you as email push notifications. If an alarm system is integrated in wAppLoxx, you can easily arm and disarm it using the app. You can also control door openers, electronic garage doors and lights. You are often out and about when access to the house is required. A hidden key, however, often leaves you feeling uneasy. With wAppLoxx, you can simply open the door to trusted persons while you’re out and about. 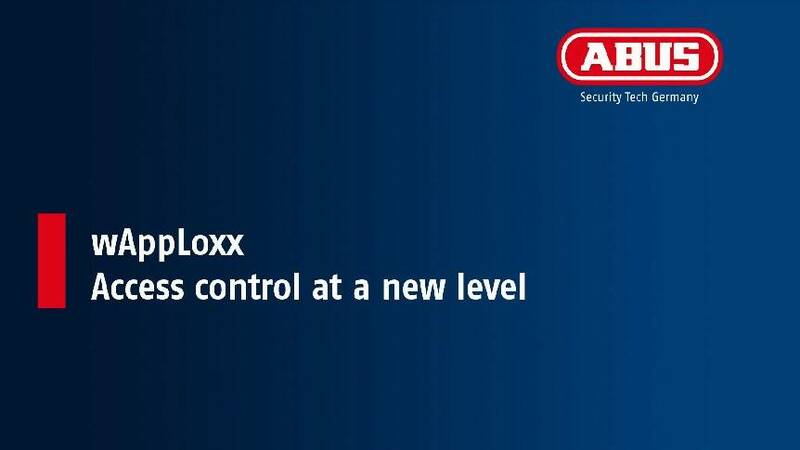 There are specialists available throughout Germany to provide professional consultation and to help you install and commission your wAppLoxx access control. If you are interested in our products, please fill out the contact form below. We will contact you shortly.